being MVP: SmartSilk Pillows & Giveaway! I love hotel pillows because they are so fluffy and you can ask for a ton of them. After our weekend at Legoland, the SmartSilk pillows arrived for review and guess who was excited to try them? Out of the bag, they were large and fluffy. The all-natural soft cotton outer shell encases SmartSilk's unique polyester micro gel fiber filling. 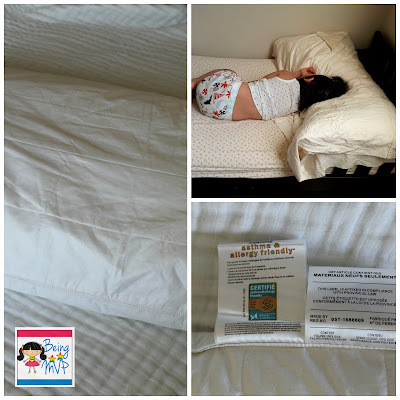 Since I have allergies, I was interested in learning that the SmartSilk™ Shield Advantage offers a proven barrier against allergens, dust mites and pet dander that live on most down and synthetic pillows. The SmartSilk™ Pillow has been certified asthma & allergy friendly™, ensuring you a cleaner and uninterrupted sleep each night. After sleeping on this pillow for a few weeks, I am in love. They provide support yet cradle my head in fluffy goodness. They remain cool to the touch and I don't have to do the flip over during the night. The pillows are so fantastic that my kiddos like to lay their head on them. Mason likes to wiggle his entire body on top of the pillow. Sigh... a mother has to always sacrifice for her children right? Buy It: You can purchase the king size SmartSilk Pillows for $85 each. Make sure to connect with SmartSilk on Facebook and Twitter! One Winner will Receive a Pair of Standard SmartSilk Pillows! I love that it is asthma friendly! I like the SmartSilk™ Mattress Pad! I would love a mattress pad protector! I learned that SmartSilk™ has been scientifically proven to beyond comparison next to down or any synthetic. The complete bed set looks heavenly! I would love one of their king size mattress pads! I also would like to have their Mattress Pad. I'd love the complete bedding set or just the mattress pad! I would die if i was able to indulge in the complete bedding set from smartsilk! looks great! I love that it is Asthma friendly. I really need to look for bedding like this. I learned that it's asthma and allergy friendly. i like the complete bed set!! I would like to have the SmartSilk Comforter. I'd love to have the complete comforter set. Wow...luxury. I love the Smart Silk Comforter too! I learned that SmartSilk is Naturally 100% hypo-allergic. I like the SmartSilk™ Mattress Pad! Thanks so much for the fantastic giveaway! I too suffer from horrible allergies, especially dust allergies which are in our beds! I love the mattress pad to protect the mattress pad to keep it free from dust mites! I like the SmartSilk™ Comforter, looks very comfy. Inhospitable to dust mites --- that's good to know! A friend was told she was allergic to dust mites. I learned this company has developed a chemical free, all natural and luxurious bedding collection that would provide a comfortable, clean and uninterrupted night’s sleep for her and others!!! I learned that their pure luxurious silk is enveloped in 100% all natural, breathable, pre-shrunk soft cotton. I also like the complete bedding set. I love that it serves as a temperature regulator, since I always tend to wake up sweating. Being asthma and allergy friendly is also a HUGE bonus! I like that all of the bedding is certified asthma and allergy friendly. I'd like the Mattress Pad. I would like The SmartSilk comforter in King. I want the crib bedding and the SmartSilk™ Mattress Pad. I love their SmartSilk™ Mattress Pad. I also really like the SmartSilk™ Comforter! One (or all) of my dogs would love a pet bed! They look great. I learned that the SmartSilk™ Luxury Bedding Collection is created and produced in-house and was developed and designed in Canada. I would also love to get the SmartSilk Flat and Fitted Sheets! I like the SmartSilk™ Mattress Pad. I learned that Smartsilk™ is the first all natural bedding to be certified asthma & allergy friendly™. I would love the complete bed set....the doggie bed is pretty cool too. I'd love to have the king SmartSilk™ Mattress Pad. I would love the Crib Bedding for my granddaughter, Nellie. Their SmartSilk comforter would be awesome too!